Quail eggs are delicate and very small - unsurprising given the size of the birds. They are considerably smaller than hen and duck eggs, and are popular with chefs not only for their attractive speckled shell, but for their large yolks and distinctive flavour. Because of their size it takes less than two minutes to soft boil a quail egg, and just over that for hard boiled. Quail eggs add instant charm to many dishes. 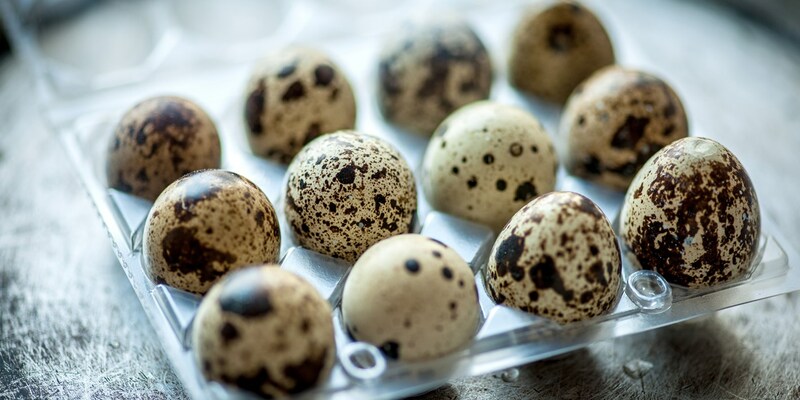 Browse our collection for gorgeous quail egg recipes, including Geoffrey Smeddle's Feuillete of poached quails' eggs with hollandaise sauce, and Dominic Chapman's Wood pigeon salad. A Scotch egg recipe can be scaled down to a wonderful bite size canape by replacing the traditional hens egg with a quail egg. Galton Blackiston uses quail eggs for a dainty spin on the classic in his Scotch eggs with bois boudran dipping sauce, just as James Sommerin does in his own robust Scotch egg recipe.